After 10 years, on 26/11 I thought of revisiting the topic. Here is my take on Use of Technology in Counter Terrorism Operations. The technologies that connect the modern world are among humanity’s greatest accomplishments. Never before have so many people had easy access to affordable tools to communicate, learn, organise and transact. Freed from the old constraints of geography and physical factors of production, a new generation of technologists has ushered in an era of exponential change. The opportunities are truly transformational: delivering lifelong access to education and good work, building world-class internet infrastructure, automating government administration and doubling down on front-line staff, bringing cutting edge tools and business models into the public sector, developing a new social contract with big tech – and much more besides. Social media has helped like minded people around the world to connect, but in some cases it has also aided the causes of Islamist or far right extremists by introducing them to similarly inclined individuals and organisations. The battle against online extremism and disinformation is an apt example of how innovations that have had an overwhelmingly positive impact on global interactions and connectivity have been exploited by groups with nefarious objectives. Whether it is ISIS videos on YouTube, the encrypted communications of the group’s supporters, or Russian-backed ads on Facebook and Twitter that seek to influence elections, none of these represents what tech developers set out to revolutionise. Terrorists excel at exploiting opportunities, forging something out of what already exists. But terrorists did not create Twitter, YouTube, or Facebook – although they have used these platforms extensively. So the balance of power lies not with abusers of platforms but with their developers and governments. it is clear that both tech companies and governments are aware of the scale of the challenge and the need to act. The introduction of artificial intelligence, machine learning and natural language processing technology to identify and remove terrorist content online is a positive move to make the Internet safer. But an overreliance on censorship detracts from the other ways technology can support the fight against extremism. As advancements in digital communications and artificial intelligence continue, those developing these technologies must learn from the experiences of social media and messaging apps, whose innovations have been hijacked by people and groups with malicious aims. Technology companies have demonstrated their commitment to tackling such abuses, but they must move beyond responding to threats and frontload considerations about security, safety, and social impact and responsibility from the design phase, rather than dealing with them as an afterthought. Responsible leadership and decisionmaking are required from governments and technology firms to deliver the products and services needed to reap the benefits of innovation and make technology work for everyone. Communications. Counter terrorism efforts have forced terrorist groups to change how they communicate. The U.S. government turned the full attention of its military and intelligence assets against al Qaeda following the 9/11 attacks and the invasion of Afghanistan. Soon after, al - Qaeda leaders found that it was dangerous to use radios, cell phones or satellite phones to communicate. Many al Qaeda leaders hiding in Pakistan were tracked down and captured because of sloppy communication methods. Identifying and tracking al Qaeda communications networks was so successful that it forced Osama bin laden to shun electronic communications devices altogether, relying instead on human couriers as a link to the outside world. When it comes to planning an attack, the internet is again an invaluable tool. Information available online can be very useful in the target selection phase of the terrorist attack cycle and can greatly aid terrorist planners as they begin to conduct surveillance for the planning phase of the cycle. And while research on the internet simply cannot replace physical pre-operational surveillance, it can provide teams with a great deal of information that can guide and help shorten the process. Smartphones with video and still camera capabilities are incredibly useful in surveillance operations, as are remote cameras that can be used to monitor the residences or offices of potential targets, all without having to place operatives on the street. Many cameras can be monitored in real time over the internet. The world has changed dramatically since the Cold War era. The ballistic missiles and satellite surveillance systems that were considered so effective at ending the Cold War are not sufficient to counter this new threat. There are many technology challenges, but perhaps few more important than how to make sense of and connect the relatively few and sparse dots embedded within massive amounts of information flowing into the government’s intelligence and counterterrorism apparatus. IT plays a crucial role in overcoming this challenge. The government’s intelligence and counterterrorism agencies are responsible for absorbing this massive amount of information, processing and analyzing it, converting it to actionable intelligence, and disseminating it, as appropriate, in a timely manner. 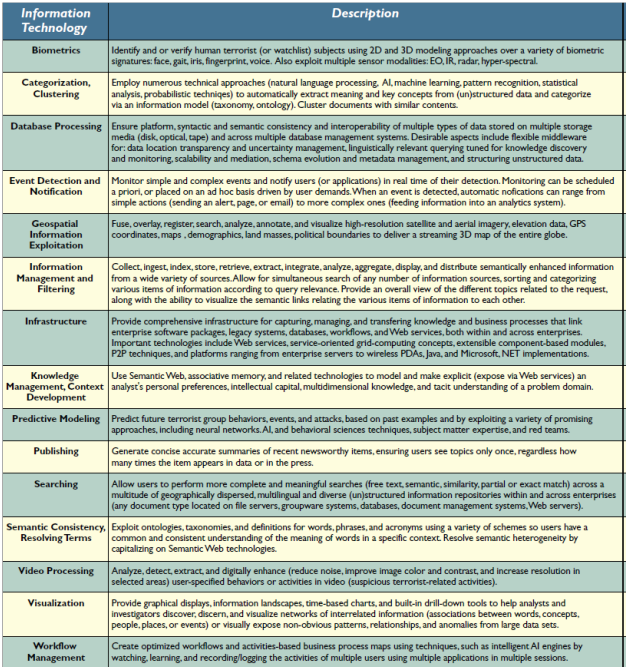 Table shows some information technologies considered important for counterterrorism. · Deploy appropriate counter-terrorism technologies that enhance decision making, but pay attention to the evolving technology landscape. · Establish partnerships with all levels of national government, law enforcement agencies, private sector security companies and local authorities, while also collaborating with international partners and allies. · Where possible, engage with the public, the media and local communities when deploying new counter-terrorism technologies, such as surveillance systems. · Carefully consider the extent to which data collection and data sharing during a counter-terrorism operation are proportionate, necessary and justified. · Identify and address any potential privacy issues as early as possible before introducing new counter-terrorism technologies. The Internet propaganda is probably the most common use of technology by terrorist organizations. Groups like the ISIS demonstrated a great mastery of the technology and a deep knowledge of the techniques of communication. Each video is carefully prepared, and its programming is meticulous and aims to reach the largest number of individuals. 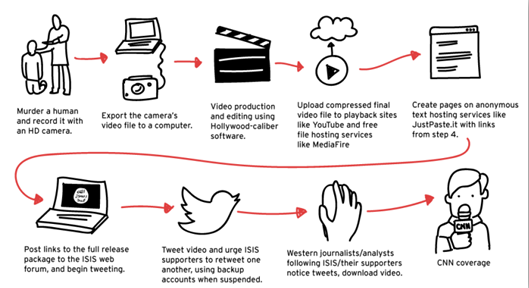 Terrorists use the new social platforms like Facebook, Twitter and media services such as YouTube. Their language is direct, young, and it can reach a specific audience by using images with a high emotional impact. The online propaganda is multi-lingual. It reaches not only Arab people and is easily accessible to young people. The amplification effect is obtained through easy dissemination of content, sympathizers and media outlets allow easy sharing of the terrorist messages through emails, messaging and mobile apps. Terrorist Propaganda. The chain of communication leading massacres and executions directly into our homes is extremely short, a few tools (i.e. A smartphone, a camera and a laptop) and the free Internet network are the pillars of the new strategy of terror. One of the phenomena worries the intelligence agencies most of all is the narrowcasting; that consists in the dissemination of information to a narrow audience. The narrowcasting targets specific segments of the public, contextualizing the practice to the terrorism, the propaganda content could be crafted to reach teenagers. Security experts have uncovered a number of websites offering pro-jihad content designed using a ‘comic-style’ and high impact Videos and Animations. The scenarios we are exploring demonstrate the great interest of modern terrorism in technology, the Internet is becoming a point of attraction for members of terrorist organizations and wannabe terrorists. Another worrying aspect related to the strict link between technology and terrorism is the possibility of acquiring counterfeit documents that could be used by militants to move across the Europe. On the internet, and in particular in the cybercriminal underground, there are many black markets where it is possible to acquire any kind of illegal product and services, including fake documents. Last week, the Union cabinet formally signed off on the setting up of the 15th Finance Commission. 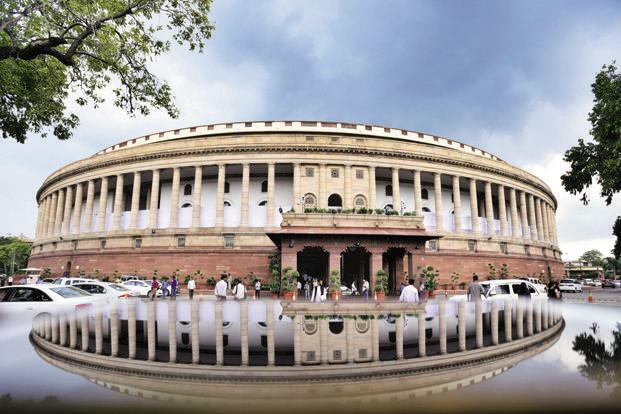 On the face of it, this is a routine exercise carried out every five years to detail the fiscal relations framework—which needs to be tweaked in accordance with the changing economy—of a federal polity like India. 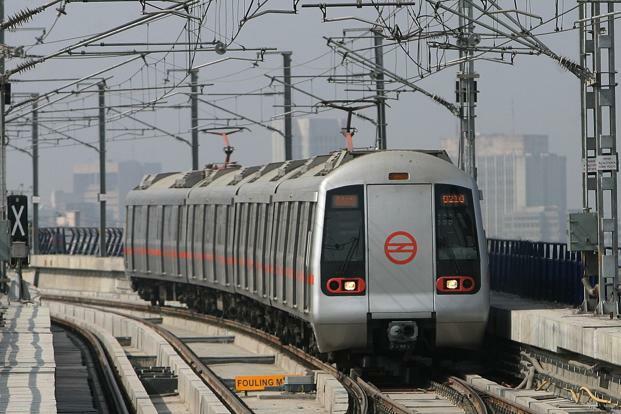 In particular, the Finance Commission, set up in 1951 under Article 280 of the Constitution of India, focuses on the vertical (division of revenues between centre and states) and the horizontal distribution (between states to ensure regional equity). On American Thanksgiving Day last week, I had the good fortune of spending a morning with my mother at Dubai’s Miracle Garden (DMG). Set in about 70,000 square metres of space it houses over 150 million flowers. Petunias, marigolds, snapdragons and violas adorn different frames in a “miracle” riot of colour in the middle of the desert. And for a few hours on a brilliantly sunny desert morning it gave a mother and son great joy. According to Brian Carlson, Chinese President Xi Jinping has not only strengthened his domestic authority, he also appears to be discarding Deng Xiaoping’s foreign policy of restraint. At the same time, US President Trump’s policies have weakened the US’ ability to respond to China’s rise. So, does the US still have the upper hand over China? Yes, says Carlson. 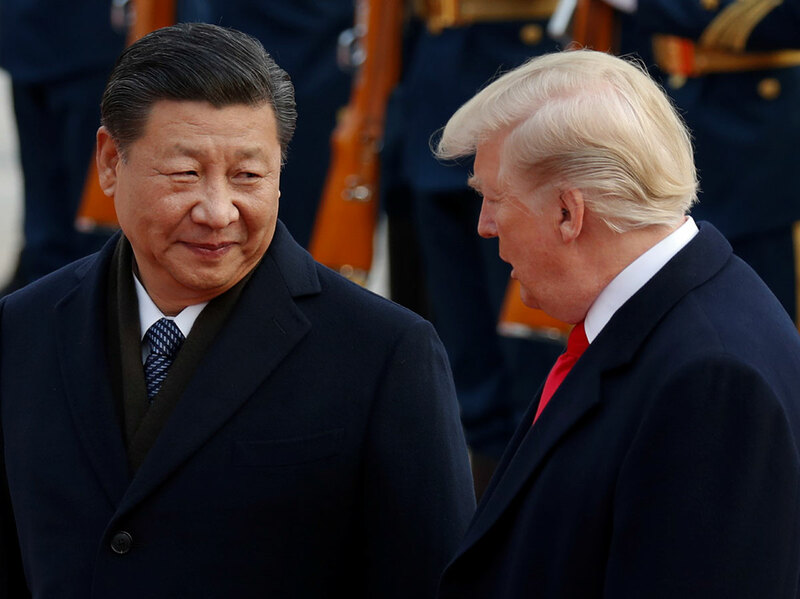 However, to preserve its global leadership role and its position in Asia, Washington must put its own house in order and adopt a clear strategy towards Beijing. Last year, a Chinese-backed shell company announced plans to purchase Lattice Semiconductor, the third-largest American producer of critical, proprietary technology used in satellites and missile defense equipment. The deal would have given the Chinese government full access to critical U.S. national security information. China has also made efforts to purchase insurance and financial firms that contain troves of sensitive personal data, and invest in real estate near U.S. military installations. These are just a few examples. China is buying U.S. companies at a breathtaking rate. Between 2010 and 2016, Chinese investment in the United States increased by over 900 percent. China’s focus on irregular war represents a challenge to U.S. military doctrine, and necessitates new thinking about inherent vulnerabilities in the current American way of war. for China, asymmetric warfare represents a tactic with ancient roots that has been successfully applied to the contemporary age. Asymmetric warfare, as seen from Beijing, means using one’s own strengths and capabilities to attack an enemy’s weaknesses. Doing so may involve the use of terrain, tactics, or the application of new or different technologies. In the early 1970s, before he was an award-winning author and the Harrington professor of history at the University of Wisconsin–Madison, Alfred McCoy was a young rebel academic who waded into the war zone in Southeast Asia to investigate the relationship between the CIA, crime syndicates, and local drug lords. The result, which the Agency tried unsuccessfully to suppress, was his classic The Politics of Heroin: CIA Complicity in the Global Drug Trade. In the 45 years since, McCoy has consistently probed the underside of American global power, analyzing how the United States uses covert interventions, local proxies, torture, and worldwide surveillance to maintain its global empire. Before Trump became President, he blamed China in very stark words for taking advantage of the United States. However, on his visit to China he toned down the rhetoric, saying he didn't blame the country for "taking advantage of another country for the benefit of its citizens". He also said, him and President Xi had "great chemistry". Though, at first sight, Trump seems to be turning on his previous verbal assaults, there is a grain of consistency - if you argue that Trump wants to put his country first himself, in a gloves-off economic competition, where it's not about cooperation but all-out competition. This is epitomized in his remark about "taking advantage of another country to the benefit of its citizens". And, in Trump's previous remarks there has also been a grain of admiration for Chinese tactics, as in: "You can win against China if you're smart." The fifth edition of the Global Terrorism Index highlights that for the second consecutive year, deaths from terrorism have decreased. There were 22 per cent fewer deaths when compared to the peak of terror activity in 2014, with significant declines in terrorism in the epicentres of Syria, Pakistan, Afghanistan and Nigeria. Collectively these four countries, which are among the five most impacted by terrorism, recorded 33 per cent fewer deaths. 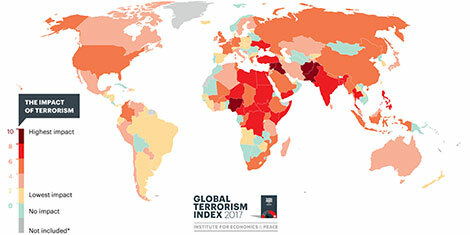 The annual Global Terrorism Index (GTI) is produced by the Institute for Economics & Peace (IEP) and provides a comprehensive summary of the key global terrorism trends in analysing the direct and indirect impact of terrorism in 163 countries. The White House is pressing to declassify intelligence allegedly linking Iran to short-range ballistic missile attacks by Yemeni insurgents against Saudi Arabia, part of a public relations blitz aimed at persuading America’s U.N. counterparts that Tehran is helping to fuel the country’s conflict. The effort to cast blame on Iran comes at a time when the U.S.-backed Saudi military coalition in Yemen is facing mounting international condemnation for enforcing a blockade on vital ports that threatens to plunge the country into a massive famine. One of America’s favorite talking points on Iran is its “destabilizing” role in the Middle East. There’s no question that Iran does things that contribute to regional instability. In particular, it frequently supports armed non-state actors that serve as alternate sources of power inside their countries—Yemen’s rebels, militias in Syria and Iraq, and Hezbollah in Lebanon. But Iran is not the only or even the biggest contributor to Middle Eastern instability. In this area its contribution is at least matched, if not exceeded, by rival Saudi Arabia. Or, to be more specific, by one particular rival in Riyadh: Saudi Crown Prince Mohammad bin Salman (MbS). Since his father King Salman appointed him defense minister in January 2015, no single individual has done more to destabilize the Middle East or put more civilian lives in jeopardy than the future Saudi ruler. Saudi rhetoric about Iran’s “aggression” aside, it’s been Saudi aggression that has most afflicted the region on MbS’s watch. 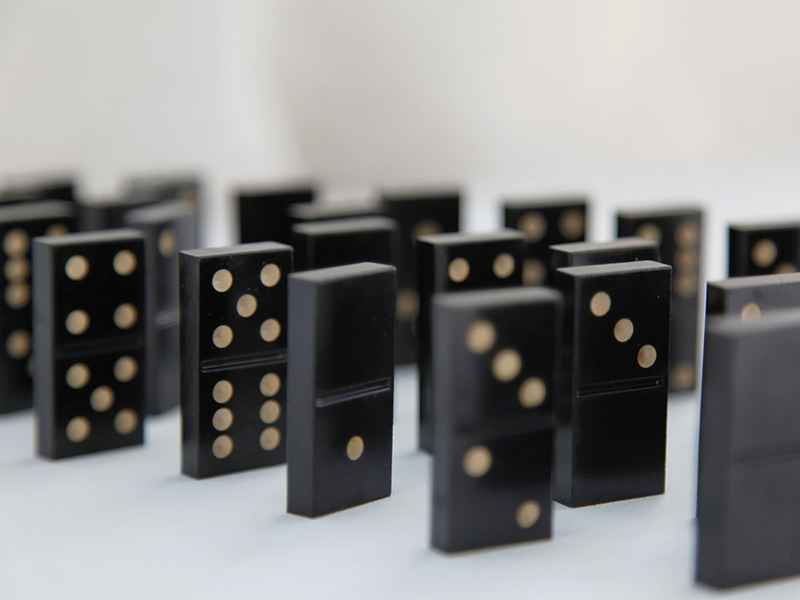 According to John Forrer, economic sanctions can be considered ‘well-aligned’ when they inflict a specific amount of economic damage on a targeted individual or group within a limited time frame. The author acknowledges the difficulties in enacting such precise measures, but contends that the process might be made easier if states would 1) further develop analytic tools and techniques; 2) construct flexible economic sanctions able to adapt to changing circumstances; and 3) create a multilateral forum for data sharing and collaboration between states. The bi-annual Zapad military exercise, jointly run by Russia and Belarus, was closely watched this September by Western nations. And while there were some concerns that the movement could be a cover for aggressive action from Moscow, the exercise was completed without incident – and for those outside the region, largely faded from memory. But for close NATO watchers, and especially the Baltic nations and Poland, seeing Russian forces operating up close provided some interesting threads to follow in the coming months. “I think we gained some insight into things we knew they could do, but it just largely refreshed us in terms of knowing this is something that we have to work on,” said Jim Townsend, a longtime Pentagon Europe expert now with the Center for a New American Security think tank. The Federal Communications Commission has announced a total repeal of Obama-era net neutrality rules, a sweeping rejection of Obama-era rules meant to keep the internet a level playing field and prevent companies from charging additional fees for faster internet access. US telecoms have pledged to broadly respect net neutrality principles, however, and this ruling will give internet service providers the freedom to experiment with new pricing models and prioritization of content. The past week, a "non-coup" forced Zimbabwe's Robert Mugabe from power. And while the Kenyan Supreme Court certified the re-election of Uhuru Kenyatta, it is almost certain the country's political unrest will continue. But this turmoil is not really that unusual; there almost always are crisis events of one type or another roiling some part of the world during any given week. And this means that at any given time there are travelers or expatriates who find themselves caught in tense situations in a foreign country. We thought it would be helpful to provide some guidance on how to react when caught in such a situation. Invented by Tim Berners-Lee in 1989, it has been central to the rise of the Information Age as it provides easy access to vast quantities of information to everyone with an internet connection. Despite its name, however, the world wide web has never been truly global because many people lack access to it. Many less developed and/or scarcely settled countries and regions lack the infrastructure to provide internet access to people’s homes, depriving millions of people of access to a vital means of communication and information. This is where mobile devices, and smartphones in particular, come into play. Over the past few years, smartphones have enabled countless, previously “disconnected" people to access the internet, bringing the world wide web a bit closer to reaching its namesake global reach. Spy satellites and their commercial cousins orbit Earth like a swarm of space paparazzi, capturing tens of terabytes of images every day. The deluge of satellite imagery leaves U.S. intelligence agencies with the world’s biggest case of FOMO—“fear of missing out”—because human analysts can sift through only so many images to spot a new nuclear enrichment facility or missiles being trucked to different locations. That’s why U.S. intelligence officials have sponsored an artificial-intelligence challenge to automatically identify objects of interest in satellite images. Over the next 20 years, the face of global military conflict will rapidly change. U.S. troops will fight simultaneous battles on the ground, in the air, at sea, in space and in the cyber realm, against adversaries that may be human or, increasingly, machine. In order to adequately train for this new reality, the Defense Department will leverage advancements in robotics, cognitive science and mixed reality systems. Many of these tools may still appear more science fiction than real life, but their influence is expected to grow swiftly over the next few decades, experts and industry leaders said. More than a decade after the improvised explosive device became the scourge of the wars in Iraq and Afghanistan, the Pentagon is battling another relatively rudimentary device that threatens to wreak havoc on American troops: the drone. Largely a preoccupation of hobbyists and experimenting companies, the vehicles are beginning to become a menace on the battlefield, where their benign commercial capabilities have been transformed into lethal weapons and intelligence tools. Instead of delivering packages, some have been configured to drop explosives. Instead of inspecting telecommunications towers, others train their cameras to monitor troops and pick targets. Instead of spraying crops, they could spread toxic gas, commanders worry. Military strategists envision the day when they will be deployed in robot armies capable of swarming defenses in kamikaze raids.